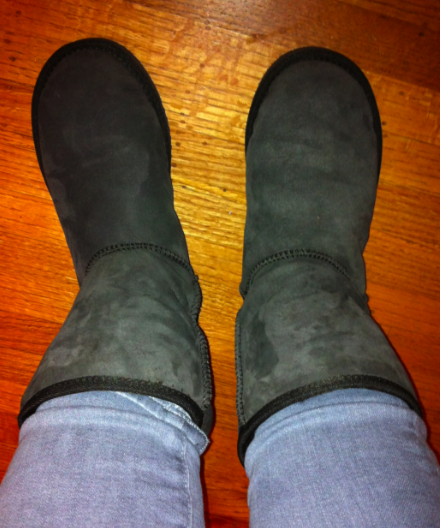 I’ve always wanted to get a pair of classic styled Uggs because the sheerling wooly insides are just so irresistibly cozy, but because the Ugg Boots are particularly unflattering to my body shape I’ve not been willing to spend the money on the real thing. The fake ones I’d seen up till now where a poor substitution that hadn’t been made of shearling, where either made of polyester fur or clumpy wool. The entire point of wearing these non fashionable boots is the cozy factor and how wonderfully shearling regulates temperature. A lovely reader tipped me off that Canadian Costco’s are now carrying this years ‘Kirkland Shearling Boot Uggs‘ and that they are made of the same materials as real Uggs and where of as good quality so I decided to check them out today and I was quite surprised. 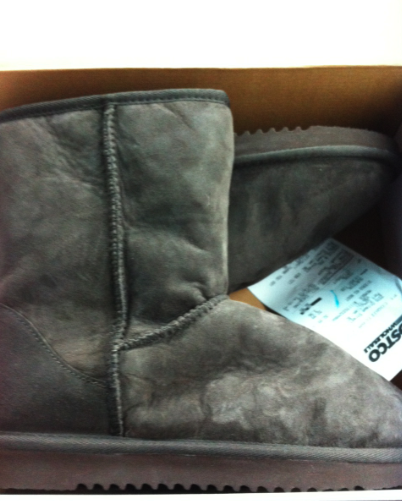 They really are identical to Ugg boots with the same material, the same stitching details and the same EVA soles. Hard to resist getting the $36.96 version of a $250 boot. The entire inside of the boot is shearling, including the bottom soles. They came in this short version in Black, Dark Brown (the ones I got) and Chestnut, and they also had a tall version with a foldable top. I’ve read before that Costco will buy out overstock of brands and just ‘rebrand’ the items as Kirkland so I would not be surprised if these are actually boots made in the same factory. 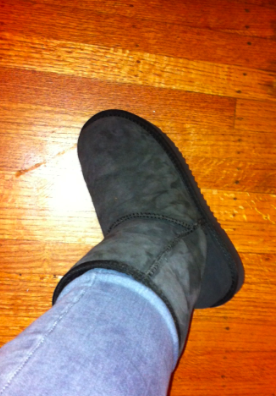 The only difference I can see with these boots and Uggs are the little ‘Ugg Australia’ logo on the back of the heel, and the EVA soles are not stamped and molded in the same pattern as Uggs. Definitely pleased with these boots and I’ll be on the hunt for some for my toddlers which are priced at $24.99. I got these in my usual shoe size, size 9 and really don’t think I could have sized down. However, If you are between two shoe sizes I’d go with the lower of your two sizes. The Oprah Effect on Lululemon.